The best way to propagate bleeding heart, either fernleaf or the old-fashioned type, is by division. The best way to propagate bleeding heart, either fernleaf or the old-fashioned type, is by division. 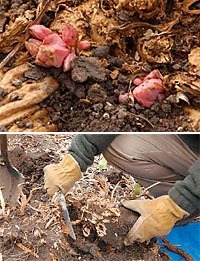 You can divide plants in either early spring or fall. You may want to divide fernleaf in the spring just before they start to grow and old-fashioned ones in the fall so you don’t sacrifice any precious blooms. The roots spread horizontally, so cut a wide circle around the crown to get as much root as possible. Don’t worry if you cut or break a few roots. Near the crown of the plant you’ll spot pink buds of new growth. Use a sharp knife — the Soil Knife works great for this — and slice through the roots, making sure each division has at least one of these buds, two or three would be better. Cut out and discard any roots that are fleshy and hollow. Reset the roots immediately; don’t let them dry out. Dig a wide hole for each division, about 2 ft. apart. Work in lots of compost before you set the roots in the hole. Cover with about an inch of soil and water thoroughly. If you want to attract butterflies to your garden, planting asters is a good start. You may never have seen a potato leafhopper up close before. They move quickly, scuttling sideways to hide under leaves, or simply flying to another plant.